Hey Loves! Today my post will be very different. I've decided to share with you all my struggles with cystic acne and the new series of treatment I've decided to try in my desperate attempt to finally have clear skin. I have been suffering from cystic acne for the past 8 years. If you are unaware of what cystic acne is, it is the most difficult type of acne to treat as unlike typical zits or pimples, these breakouts are embedded into the skin tissue causing large painful bumps. The skin is essentially infected as cystic acne ruptures beneath the surface of the skin, pushing the blockage and swollen contents beyond the reach of traditional, topically-applied anti-acne products. It is one thing to deal with the bumps themselves, but even more painful (for me atleast) is the sight of the scars and dark spots these cysts leave behind. I have tried many prescription topical products, acne systems, antibiotics and then some. I have tried changing my diet, I increased my water in take and walk around with my water bottle pretty much every where I go. While there were periods where I did catch a break and saw a change, it was usually small and eventually my acne would come back- and often with a vengeance. I spent A LOT of money with dermatologists from consultations to filling prescriptions and soon I became more and more FRUSTRATED! Last year May was the last straw for me though. For the 4th time I refused the doctor's suggestion of birth control or Roaccutane, these are apparently the best bet when your acne is hormonal. I dont believe in taking something that will alter my reproductive system for the sake of clear skin AND I definitely was not going to start a treatment that required me signing a contract to say in case of death my doctor would not be liable. JUST NO! My last derma visit ended with a failed salicylic chemical peel which included being INJECTED 7 times in my cheeks with steroids. I was just DONE. After that I decided to listen to my mom and go the natural route. This included changing my regiment to black soap cleansers, organic apple cider vinegar as a toner, grape seed oil moisturizer, aloe vera and tea tree oil. I included folic acid, primrose and zinc supplements as well. I chose these in particular to balance my hormones and repair my skin. The thing with natural products however is it takes a lengthy time to see changes and I was running thin on patience. I spent the greater part of last year being very withdrawn (and still am). I was back in a really sad state from College when I would skip lectures just to avoid people seeing my acne. Luckily Ive worked in Social Media for the past 3/4 years so I can work from home on some days. I really appreciated that because I just hated interacting with people because I just knew my acne was the first thing they will see. I didnt want to go anywhere anymore, especially if I wasnt wearing makeup. The thing is though, when you have 8 years of damaged skin, there is very LITTLE that make up can do to hide acne scars (and by scars I mean dented and discolored skin). When I started my blog the first thing I told my photographer to do was to use Photoshop to fix my skin. I can barely accept what I see in the mirror and I really didnt want others to see it either. Just when I really lost all hope, earlier this year I came across a local spa, "Pandora Day Spa". What caught my eye was that they offered clinical facials and the before and after images of clients who had tried them were rather impressive. It took me months to decide whether I should really try them out as I have done a glycolic acid peel and salicylic peel before at another spa and they were both an absolute waste of money. When the Pandora Spa relocated last month to just 2 minutes walking distance from my office, I took it as a sign and decided to try them out. I booked my appointment for an acne scarring therapy facial however after my first consultation with the aesthetician Emma, I was told my skin was way too sensitive and pretty much too frail for that treatment. 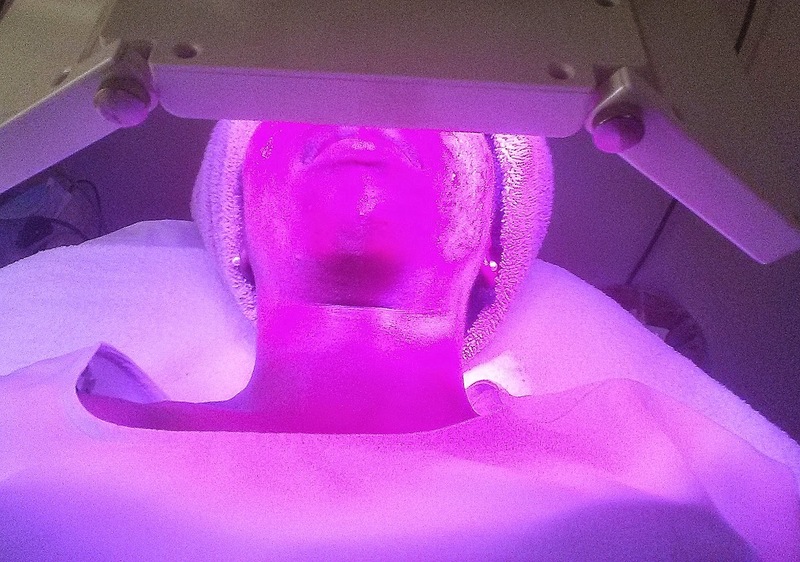 I shared my story with Emma who also had previously suffered much like I did (but you could never tell now)- and she suggested a plan; I would do a series of clinical facials to help to get my skin back on course, beginning with an LED therapy session which is a painless treatment that plumps your skin by boosting collagen. These photos are AFTER the first LED therapy. I am not comfortable showing the BEFORE images. This LED treatment along with the Ultrasonic Stem Cell treatment I will do next will strengthen my skin so I can then do the Micro needling treatment to correct my scarring. Each session runs me between $50-60 USD. While I really had no intention to spend that kind of money right now, it is a sacrifice I've made up mind to make. A sacrifice which also requires not wearing make up for the next 2 weeks. *weeping*. 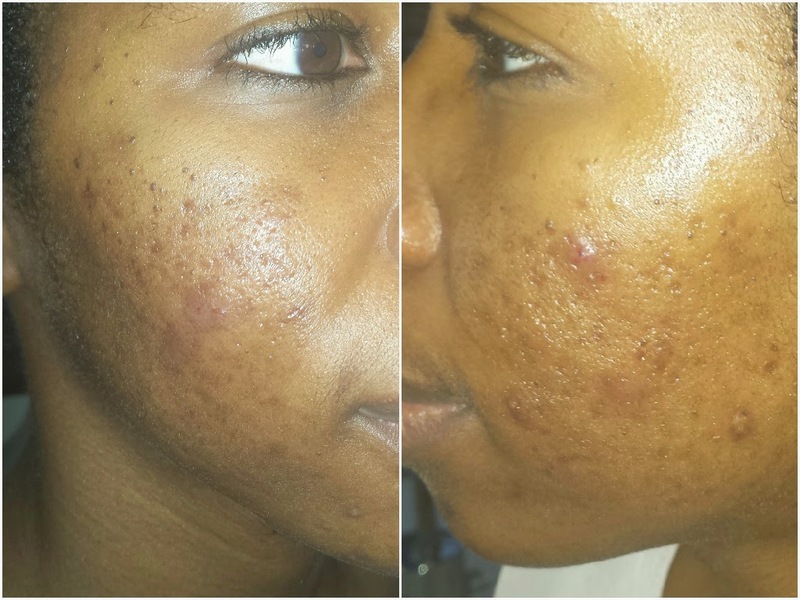 I just wanted to share my journey with you all as I am sure there is someone who can relate and if these treatment sessions are successful, it could be a treatment option to think about if you are suffering from acne too. I have so much more to say but I will leave it until my next post. I will make an update after every treatment to show the progress, if any. Do feel free to leave your suggestions and comments, I would love to hear them. oh wow! I have some problems with my forehead skin cuz of pimples and always hard to hide it only with make-up. But diet did helped me and probably being married. Happy women has happy skin ;) I wish you good luck and hope it will look better soon! Wish you all the best with your treatments. I have an obsession with maintaining and see flawless skin and I hope you'll have that too soon! Fellow Jamaican here who's basically facing what you're going through. My treatments were inconsistent as I found them expensive but what I did was basically controlled the acne first. My dermatologist Dr. Persadsingh gave me pills and creams! And they helped, so right now I'm working on the hyperpigmentation. I can tell you that using apple cider vinegar as a toner works wonders! And also, you can order this cream Meladerm online, it's a miracle and oh, please remember your sunblock or all this will be for nothing!